The RAAF's requirement under AIR 5398 for Anti-Radiation Missiles for the F/RF-111C, the F/A-18 and the P-3C has attracted a number of bidders. In the preceding part of this series we reviewed the TI AGM-88 HARM, which is the leading US contender for the requirement. The Matra BAe Dynamics ALARM missile, designed for the RAF and also used in the Gulf War, has been offered by BAeA to meet this requirement. This weapon is a very different missile to the HARM, designed to a different requirement, and embodies a number of innovative technical features which make it an interesting candidate for the role. The ALARM owes its origins to a detailed study conducted by the UK MoD during the mid-seventies, in the aftermath of the SEA conflict. The UK studied the USAF/USN Wild Weasel/Iron Hand model of defence suppression very carefully, as the US experience against the Soviet designed/armed/partially manned IADS was clearly indicative of future trends. The deployment of increasing numbers of high performance SAM and AAA systems indicated that lethal defence suppression using ARMs would be an essential feature of any future air wars. This assessment was indeed proven correct in the following two decades, the prime example being Desert Storm where in excess of 2000 ARMs were fired against elements of the Iraqi IADS. The RAF, unlike the West German Luftwaffe, was not enthusiastic about the US Weasel model. This was for a number of reasons. The first was that the RAF did not wish to incur the cost and in-service support overheads of deploying sophisticated and complex Emitter Locating Systems (ELS) such as the APR-38/47 fitted to the F-4G. The UK position was that this would cut into force sizes, reducing the deployable number of aircraft which could be dedicated to SEAD operations. It was further considered that the adoption of the Weasel operational model would expose SEAD aircraft to attack more frequently, this in turn incurring high loss rates. no aircraft were to be permanently dedicated to the SEAD mission, and no specialised sensors such as ESM or ELS were to be fitted to aircraft tasked with the SEAD mission. the ARM should be capable of launch from aircraft flying at high speed and very low altitude from outside the range of a hostile air defence weapon. the ARM should be sufficiently small and light that large numbers could be carried by Tornado IDS aircraft tasked with a SEAD mission, and that useful numbers could be carried as defensive weapons on Tornado IDS aircraft tasked with strike or recce missions. The size and weight requirement was seen as producing other dividends, as the weapon could be carried by other aircraft such as the Harrier or Hawk. The requirement for the missile to be wholly autonomous in its capability would also mean that arbitrary launch platforms, regardless of EW avionic fit, could employ the missile effectively. The ALARM design reflects these basic requirements. Needless to say, the requirement for a fully autonomous seeker, packaged into a form factor and weight comparable to the sixties Shrike, was not an easy one to meet. Moreover, the ALARM was to also provide a novel parachute loitering mode, in which the missile climbed to a high altitude above the target area, deployed a parachute and listened for hostile radars. Once one was detected, the missile would jettison the chute and dive on to the emitter. 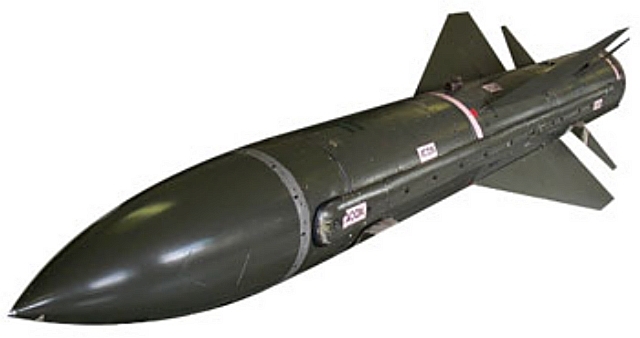 The RAF Air Staff Requirement 1228 competed the BAe ALARM proposal against the AGM-88 HARM, the ALARM was selected in 1983 and a fixed price contract agreed for the delivery of a substantial number of rounds, believed to be around 750. Initial deliveries were planned for 1987. Difficulties were encountered during development with the compact Royal Ordnance Nuthatch rocket moter, which led to the design of the Bayard replacement motor by MBB/Bayern Chemie. Initial testing of the seeker and release testing was carried out using modified rocket motors from the then obsoleted Red Top AAM. The contract was renegotiated in 1988 to accommodate the new motor design, with trial firings carried out in the UK and at the USN China Lake weapons range. The last development trials were done at China Lake in late 1990, clearing the weapon for operational deployment in the Gulf. 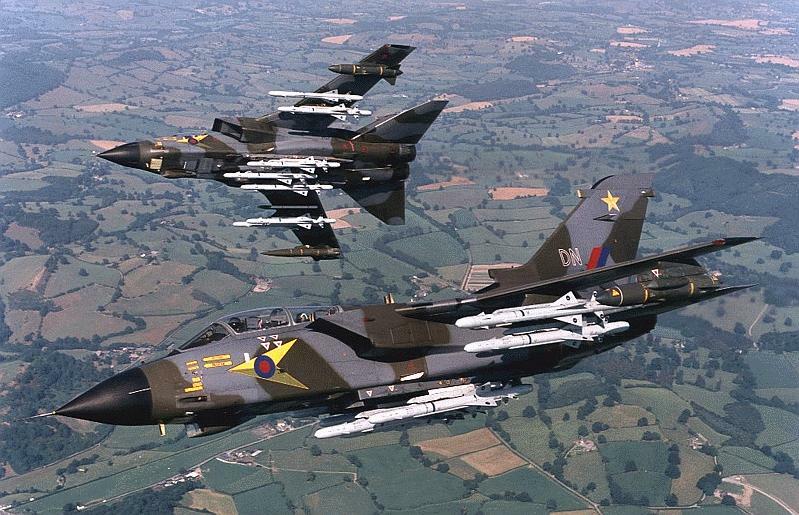 The weapon acquitted itself well during the Gulf War, the RAF wholly expending its early stocks of the missile during the campaign (unconfirmed sources suggest in excess of 100 rounds). Because the missile steeply climbs after launch to attack its target from above, many anecdotes exist about Allied aviators who were quite alarmed (no pun intended) at the sight of the missile zooming up to altitude, often mistaking it for an Iraqi SAM. The weapon is currently in service on the RAF and Saudi Tornado IDS, and is the RAF's standard SEAD weapon. To fully understand this unique missile we must take a closer look at its design features and operating modes. The ALARM is functionally divided into a seeker, a Mission Control Unit, a Navigation Unit, a Fuse, a Warhead Section, Rocket Motor Section, Actuator Module and Parachute Assembly. The missile is 4.3 m long, has a wing span of 0.72 m and a diameter of 0.224 m, weighing 584 lb (265 kg) at launch. The Seeker is much like that of the HARM, an intelligent microprocessor controlled passive homing receiver, designed to recognise the characteristic Pulse Repetition Frequencies (PRF) of programmed threat emitters. The ALARM uses a wideband RF antenna/receiver subsystem. Material published in a Jane's reference suggests a conventional quartet of cavity backed spiral antennas, forming a fixed two axis interferometer with lower mid-band to hi-band coverage. The UK have neither disclosed nor confirmed any performance figures for frequency coverage. The Superheterodyne seeker is designed to operate in high density environments, selecting only programmed emitters with specific signatures (PRF). The seeker has ECCM features designed to defeat countermeasures. Like the HARM, the ALARM employs "flex" logic to select the highest value alternate target, should the primary target go off the air. The Mission Control Unit contains the Zilog Z8002 microprocessor running the autopilot and navigation software, and the software which manages the missile's operation. The software is written in CORAL, a language commonly used in UK military embedded systems. The 1553B interface is tied to the MCU, which allows the missile to communicate with a suitably equipped launch aircraft. The Navigation Unit contains a BAe ALARM specific strapdown inertial package which produces the acceleration, velocity and position data used by the MCU software. The missile battery and launch aircraft power distribution adaptor are installed in the MCU module. The launch aircraft's power rails are converted to DC in the ALARM specific launcher, which feeds prelaunch DC power directly to the missile. The Fuse module is unique to the ALARM, and employs a forward looking solid state laser rangefinder. Because the ALARM is designed to dive down vertically and pass abeam the target emitter, this specialised fusing arrangement is designed to measure the altitude of the missile precisely, and initiate the warhead as the missile passes the radar's main electronics enclosure (or antenna). This ensures that the warhead is as close as possible to the target when it is fired. The warhead is a preformed heavy metal (believed to be Tungsten) casing blast fragmentation device designed to produce high velocity armour piercing fragments which are intended to perforate not only the antenna, but also the supporting electronics and operator vans or enclosures. The low smoke boost sustain burn profile rocket motor assembly and casing form the missile centre section. The motor exhausts through a blast tube which runs through the two tail section modules. The fixed cruciform wings are attached to the motor casing. Aft of the motor casing and wrapped around the blast tube is the Actuator Module, which contains the four electrical servoes which drive the independent cruciform tail surfaces, which provide pitch and yaw control, as well as roll stabilisation. The missile tail section houses the two stage parachute system used for loitering modes. In operation the rear fuselage shell is jettisoned and the drogue chute deployed, in turn extracting the main parachute. The missile then dangles from the main chute, scanning for a threat emitter. Clearly the ALARM is a more complex missile in comparison with conventional ARMs. The vertical attack terminal trajectory requires a unique fuse arrangement and the loitering mode requires the parachute system. Both are however used for good technical reasons. Conventional ARMs home primarily upon the mainlobe and horizontal sidelobe and backlobe emissions of the target, attacking the target in a shallow dive trajectory. Modern radars with very low sidelobe antennas will thus present a "blinking" target to an approaching ARM, which must estimate the real position of the target from the intervals of active emission, when the antenna is radiating in the direction of the inbound missile. In the terminal phase of the ARM's flight, a slowly rotating antenna on the target may be pointing away from the missile, which will therefore have to follow an inertially steered trajectory based upon previous measurements of the radar's position. As a result the missile will more than often not hit the target directly, but pass within several metres of the target, using its proximity fuse to set off the warhead. This imposes the need for a larger warhead to achieve acceptable lethality. The vertical attack ALARM is designed from the outset to home in on the vertical sidelobes of the threat emitter. Since most air defence radars are designed for high bearing accuracy, they tend to have good horizontal but poor vertical sidelobe antenna performance. The ALARM exploits this, as no matter what direction the main beam is pointing in, the ALARM sees a steady albeit fluctuating microwave emission leaking upward from the target's antenna. This allows the ALARM to home in precisely, indeed the missile is designed to select an aimpoint about 1 metre away from the target antenna/electronics enclosure. The intelligent seeker knows what type of radar it is attacking, and therefore also knows what the elevation of the antenna is above the ground. This information is then used to select the most suitable altitude for warhead firing, typically when the missile is directly abeam the antenna or electronics enclosure. This scheme was specifically designed to defeat mast mounted antennas, which have become a very popular means of improving the low altitude coverage of ground based air defence radars. Needless to say a smaller warhead can achieve similar or greater lethality if fired very close to the target, compared to a larger warhead set off at a greater distance. It is worth noting that mast mounted antenna variants are employed by systems such as the Soviet designed S-300 Flap Lid, Big Bird and 76N6 Clam Shell associated with the SA-10 Grumble SAM, the Grill Pan acquisition radar associated with the SA-12 Gladiator SAM, the Tube Arm acquisition radar associated with the SA-11 Gadfly SAM, as well as the older P-15M Squat Eye. Other systems employing this technique are the Siemens-Plessey Watchman, Ericsson Giraffe series, Alenia Argos 45, the PRC Ibis and Type 706 radars, the Indian Indra-I (GRL 600) series, and the widely exported Thomson-CSF TRS 2100/2105/2106 Tiger series. The parachute loiter modes were adopted in order to force threat emitters to remain shut down for as long as possible after the launch of the ARM. The classical defensive tactic used by a radar operator is to shut down if an ARM is seen to be launched, thereby denying it a signal to home in on accurately. Once the ARM falls out of the sky, the radar can be lit up again. As a result, a clever operator may force an incoming SEAD aircraft to expend several conventional ARMs, if the SEAD aircraft's rails are empty then the SAM system can resume operation while aircraft are still within shooting range, and possibly score a kill. The parachute loiter modes of the ALARM leave the Sword of Damocles literally hanging over the radar operator's head, as soon as he lights up the missile dives on to him. The ALARM will typically loiter for several minutes at medium to high altitude, subject to the initial launch profile of the missile. The ALARM has five distinct operating modes which are programmed prior to launch. All of these modes employ the vertical attack trajectory. The Direct Mode is a classical offensive mode, where the ALARM is fired directly at the chosen target to which range and bearing are known, the missile flies an optimal trajectory to engage the target in as short a time as is possible. Should the emitter go off the air, the missile will flex to the next best target. The unique Loiter Mode also assumes the target range and bearing are known, and is used to defeat a radar which is being taken off the air to prevent ARM attack. The ALARM will fly a climbing trajectory to a point above the target, deploy its parachute, and while slowly descending it will search for the target. Once the target lights up, the missile will dive on to the target. To force an emitter off the air for a longer period of time, a second round would be launched some time after the first. The third mode which assumes known range and bearing to the target is the Dual Mode, in which the missile initially flies the Direct Attack profile. Should the target shut down, the missile will switch to Loiter Mode and wait for it to light up again. Two modes are used for situations where the position of threat emitters is not known prior to launch. The Corridor/Area Suppression Mode is optimised for low altitude launches, in this mode the missile initially climbs steeply, and then coasts in a shallow dive searching for targets programmed before launch. The Universal Mode is similar, but is optimised for medium to high latitude launch and provides a larger search pattern and better range. Both of these modes are intended for use against mobile SAM systems or maritime targets. The ALARM is programmed with target radar parameters, operating modes, fusing altitudes and target priorities prior to launch. Aircraft with a Mil-Std-1553B bus and proper onboard software can reprogram the missile at any time prior to firing. Otherwise, the missile must be programmed on the ground. Three missile interfaces are supported. The simplest is the Two Signal Interface, where the missile is programmed on the ground. The launch aircraft is pointed at the target and a simple pair of electrical pulses are sent to the missile to fire it. The remaining two types of interfacing require a 1553B bus and triple phase electrical power supply to the missile rail, the latter to power up the missile electronics. The Active Interface allows the aircraft to download position and velocity data prior to launch, thereby allowing aggressive manoeuvre before launch. The Full Intelligent Interface allows the missile to be fully reprogrammed prior to launch, as well the programming and Built-In-Test status of any missile can be viewed on a cockpit display. The ALARM is launched directly off the rail in the same manner as a Sidewinder. It requires ALARM specific rail launchers, which are compatible with standard pylon interfaces. The control fins are unlocked 0.5 seconds after clearing the rail, upon which the missile stabilises itself in all axes and initiates its climb. In a range known mode, launched at high altitude, the missile is credited with a range in excess of 50 NM. Tossing the missile at 4G during launch adds an additional 10% to the achievable range performance. Due to the three types of interface supported by the ALARM, the RAAF has a wide choice of options in terms of how it would carry the missile. The simple Two Signal Interface would allow the aircraft to carry as many missiles as there are ALARM compatible stations available, however since this style of operation requires that all programming take place on the flightline, it is operationally less flexible than the latter modes. The Active Interface provides the launch aircraft with wider manoeuvre options but also requires flightline programming of modes and emitter parameters. Full operational flexibility ie reprogramming modes once airborne requires that the intelligent interface be used, and thus proper software support for the missile would be required in the stores management system and the EW suite. As is the case with the HARM, the basic warload for the F/A-18 and F/RF-111C AUP is four rounds on missile specific launchers, mounted on standard wing pylons. A larger warload could be carried by fitting the pylon with a suitably stressed dual rail launcher, as is done on the Tornado. This potentially doubles the weapon loadout to eight rounds. Only stations with a Mil-Std-1760/1553B bus interface provide the full operational flexibility of the missile. Availability of surge stocks in wartime would be subject to agreement between the UK and Australian governments, following any such request from the ADF. Because the ALARM delivers its best capability in its range known modes, as is also the case with the HARM, the use of a rangefinding receiver (or ESM/ELS) on the F/A-18 and F/RF-111C/G would be desirable to maximise operational flexibility. Whilst the ALARM will operate in all of its five modes using the Full Intelligent/Active Interface, the need to program the missile with target parameters on the ground when not using a rangefinding receiver (or ESM/ELS) will extend operational response times (this is also true of the HARM). While this may not be an issue for a set piece sortie into a known fixed land based air defence system, it would limit flexibility in more dynamic situations. Indeed this the reason why the USAF and USN are fitting rangefinding receivers to the F-16C HARM shooters and possibly also the F/A-18C (see the upcoming Update on the Loral/LMC TAS). The RAF model is analogous to the traditional USN approach, which is to bypass defences enroute, and use the ARM in a pre-programmed or reactive mode to engage terminal defences. The composition and location of target defences is determined apriori by electronic or other reconnaissance, and the ARMs programmed before the sortie. In summary, the ALARM is a combat proven and technologically innovative missile design, which can be launched by aircraft with a minimum of missile specific hardware modifications. The missile offers a modern seeker, a unique loitering mode, a highly lethal terminal attack profile, a standard Mil-Std-1553B interface, a lower launch weight than competitive missiles, and a compact form factor. As is the case with the HARM, operational flexibility of the ALARM is maximised when this missile is supported by a rangefinding receiver. The ALARM's complexity results in higher cost than competitive missiles, which constitutes its principal limitation. The lightweight ALARM weighs in at 584 lb, and is fired from ALARM specific rail launchers. This allows SEAD aircraft to carry a substantial load of weapons, this RAF Tornado IDS is carrying no less than 9 rounds on triple rail wing pylon launchers and three fuselage stations (BAe). 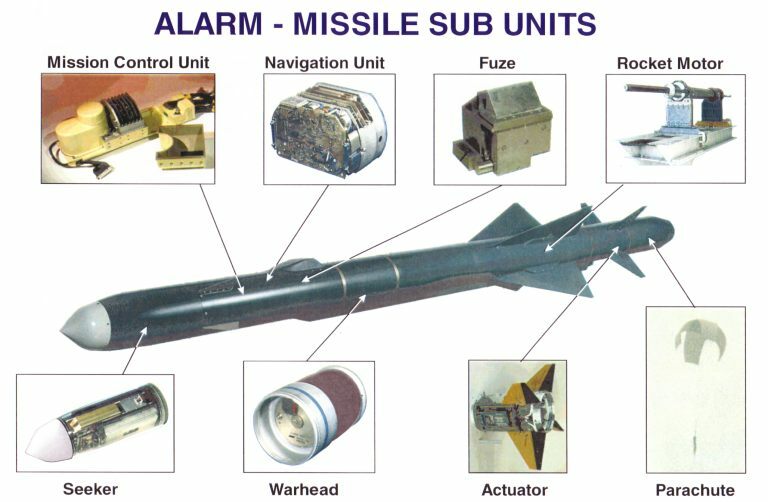 The ALARM employs a standard Mil-Std-1553B interface directly to the missile, via which aircraft with suitable software can reprogram the missile before launch, setting target parameters such as type, priority and warhead initiation altitude for each type of target radar, as well as monitor missile status. The missile can be fired from aircraft without the 1553B bus, but must be programmed on the ground (BAe). Pic.4 ALARM delivery modes (Author). The standard SEAD sortie warload for the F/A-18A+ and F/RF-111C/G AUP (depicted) is four rounds on ALARM launch rails, on the wing pylons. Should the dual ALARM launcher be used, then this warload could be doubled. The missile is also intended for use as a defensive weapon, supplementing a warload of bombs or other weapons. 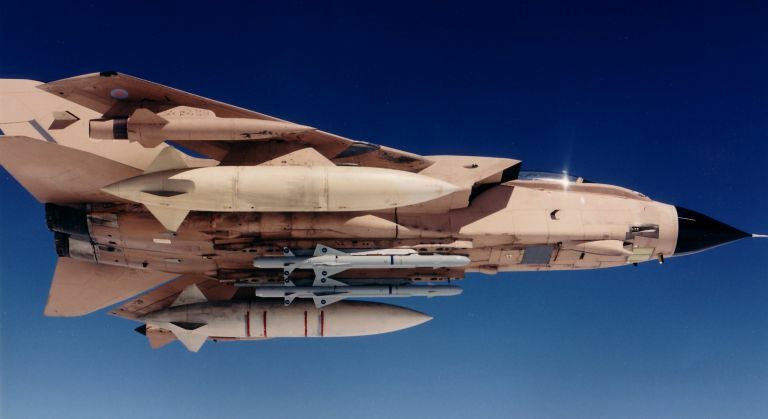 As example of such a mixed warload on the F/RF-111C AUP would be three Harpoons on wing stations, and one or two ALARMs on a single or dual launcher (Author). Generally not regarded as a hot favourite in the AIR 5398 bidding, the Matra Armat is a missile with a lengthy pedigree. It is an evolved variant of the anti-radiation version of the Franco-British BAe-Matra AS 37 Martel missile. The Martel was built in two variants, a UK designed AJ.168 TV guided version and a French designed AS 37 anti-radiation version. The UK deployed both variants on the Buccaneer S.2B, primarily as maritime anti-ship weapons. The French deployed only the AS 37 on a number of Mirage subtypes, and the Jaguar. An enhanced variant of the AS 37, designated the Armat (Anti Radiation MArTel), was developed in the early eighties, and deployed with the French Air Force in 1984, subsequently exported to Egypt, Kuwait and Iraq. The missile was reputedly used during the Iran-Iraq war to destroy Iranian radar sites, fired from the Mirage F.1 . The Armat shares its basic airframe and propulsion with the AS 37 Martel. The Armat is a heavyweight among ARMs, weighting in at 1200 lb / round, with a 331 lb high explosive warhead, and with a fuselage length of 13.5 ft and diameter of 15.7 in. The large airframe accommodates a Hotchkiss-Brandt/SNPE Basile solid propellant boost stage with a 2.4 second burn, and an SNPE Cassandre solid propellant sustainer with a 22 second burn. The missile has a quoted range for a high altitude launch of about 50 NM. Compared with the AS 37, the Armat has a significantly improved passive homing seeker designed in the early eighties by Dassault Electronique. The microprocessor based seeker will home on to a programmed emitter, be it a radar or a jammer, and uses inertial midcourse guidance. With its high launch weight, heavyweight warhead and long range, the Armat is primarily an offensive strategic ARM designed to destroy Early Warning and Ground Control Intercept radars. This is where it differs fundamentally from the HARM and the ALARM, which are built to also perform as defensive ARMs carried as part of a mixed weapon load. As the missile is 50% heavier than the HARM, and twice the weight of the ALARM, it is unlikely to compete successfully against these newer missiles. The Armat is a heavyweight offensive strategic ARM designed to suppress Early Warning and GCI radars with a large 331 lb warhead. This missile is used by the French Air Force and was exported to the Middle East, reputedly fired by the Iraqi Mirage F.1s against Iranian sites during the Iran-Iraq war (AS 37 depicted).